TutorNET has created this innovative instrument of analysis and it proposes it in exclusive in the world of the opticians and the optometrists. 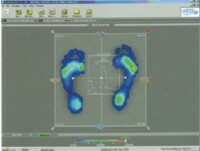 The stabilometric footboard binds together to its software of analysis is very important because it allows to give you all the relative data about the postural variations in relation to the glasses in use by the customer: it is the only instrument that canhelp you to choose the right correction instruments according to the posture of the customer. StabiloNET, through the obtained information, can also helps the optometrist to choose the better multifocal lenses, with greater possibilities to be tolerated from the customer.